Helen Jessup gives us the answer on how to sweeten up the looming chilly autumn with her caramel apple choux bun recipe. Simple and deliciously puffy, these are the perfect sweet treats to make. This time of the year apples form a large part of our diet as we have an apple tree brimming with ripe fruit in the garden. If we didn’t have enough apples already we also relieved my brother in law of some jumbo apples from his trees, which were promptly peeled, cored and sliced and loaded into the freezer. If you find yourselves with lots of apples that need peeling I would definitely recommend investing in an inexpensive time saving apple peeling machine, which has been a lifesaver to me. Choux buns, eclairs and profiteroles are easier than you may imagine to make, and can be filled with cream, custard and/or fruit. 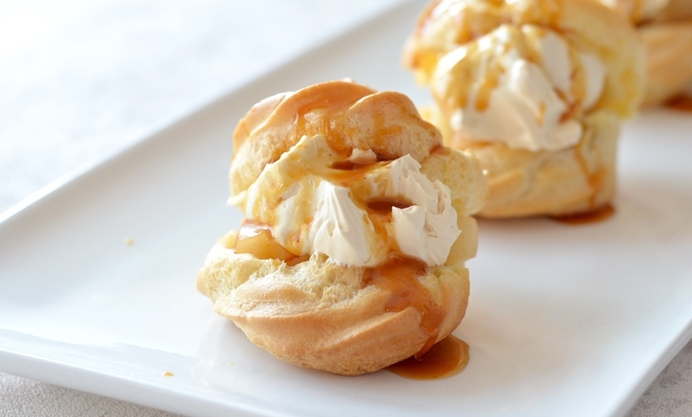 These choux buns are filled with cinnamon apple and caramel cream, and topped with more caramel.